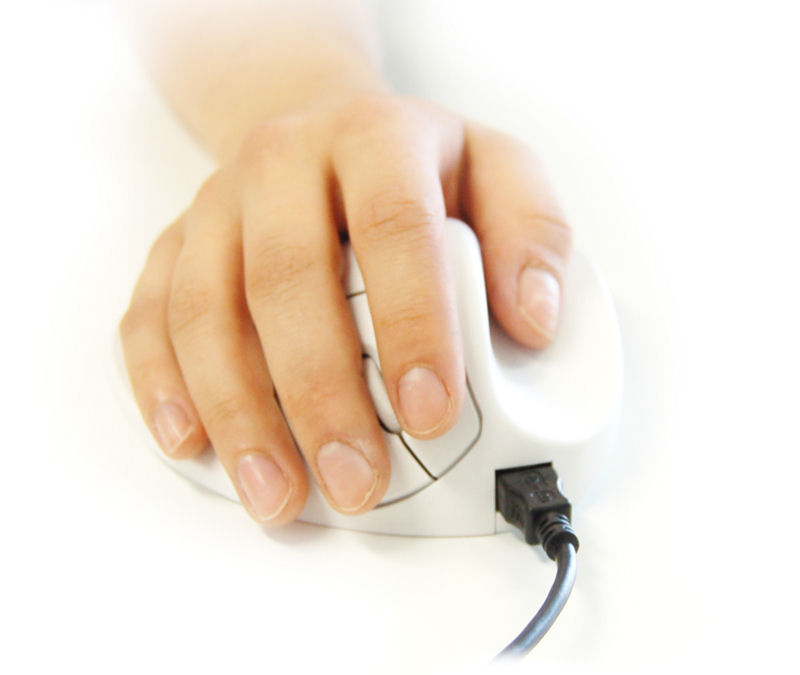 The Handshoe Mouse from Hippus NV is designed to eliminate the 3 most common issues associated with the use of a computer mouse - gripping, pinching, and tensing of the fingers. The unique naturally supportive contours of the Handshoe Mouse permit the hand and fingers to completely relax whether actively engaged with the mouse or just resting between movements —like they do in a well-worn glove. This relaxed position eliminates the sustained static tension that most users tend to maintain when using a mouse and which are associated with the development of RSI. With multiple size options available —4 for the Right and 3 for the Left— anyone can receive full support of the hand, wrist and fingers while actively mousing. 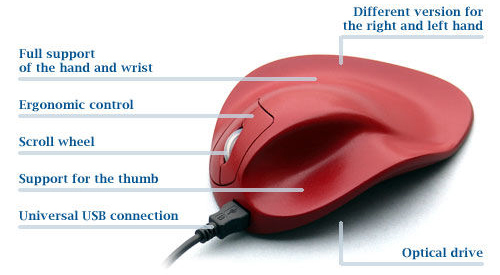 The recommended usage for this mouse is on the desk surface with the forearm fully supported by the desk or arm rest of the chair. 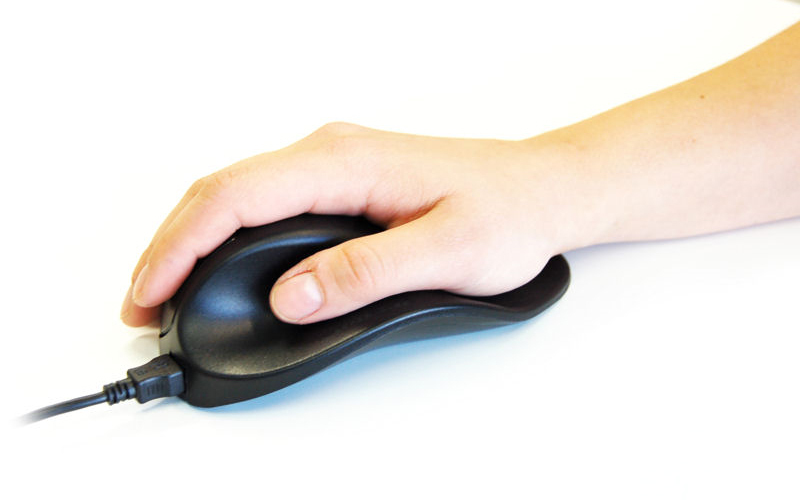 The Handshoe Mouse does not require any passive muscle tension or use, and prevents users from excessive muscle exertion while actively using the mouse, making it the only mouse on the market that is almost impossible to use incorrectly. 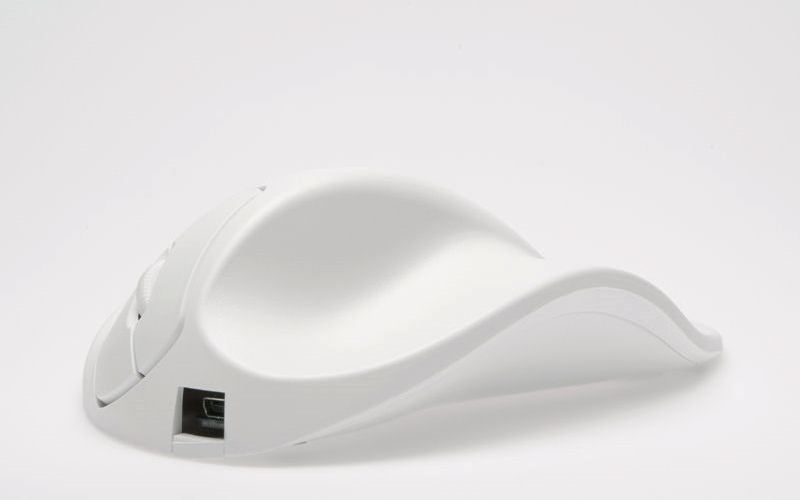 The waterfall design of the Handshoe Mouse provides a naturally curved resting support for the fingers, allowing them to fully relax between clicks. This eliminates the negative effects from an anticipation of the click which on traditional mice results in raised, hovering fingers as well as overexertion and overextension of the extensor muscles. 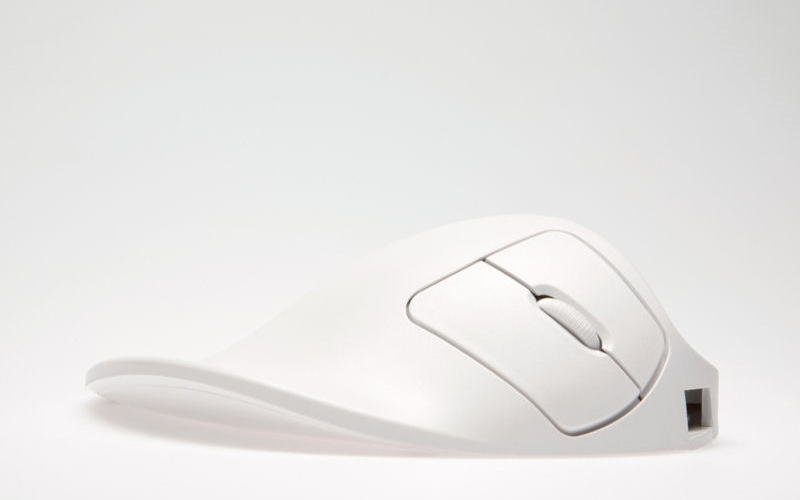 The design also incorporates a thumbrest which supports the thumb in a neutral and relaxed fashion making the Handshoe Mouse a good option for those experiencing thumb-related issues such as DeQuervain’s Tenosynovitus. The optical tracking uses advanced BlueRay Track technology combined with a 1500 DPI sensor which will work on almost any surface. Two light click force buttons (three on the large model) and a scroll wheel provide standard "Plug-and-Play" mouse functions. The Handshoe Mouse is also available in a rechargeable wireless model. 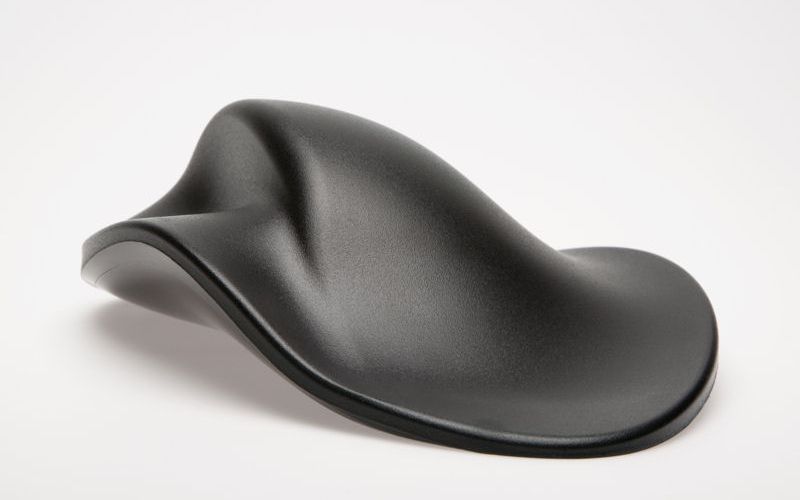 Due to the greater amount of weight resting on a Handshoe Mouse (larger mouse, weight of hand and part of forearm) it is recommended that a firm, low friction mousing surface be used to minimize the effort required to move it. 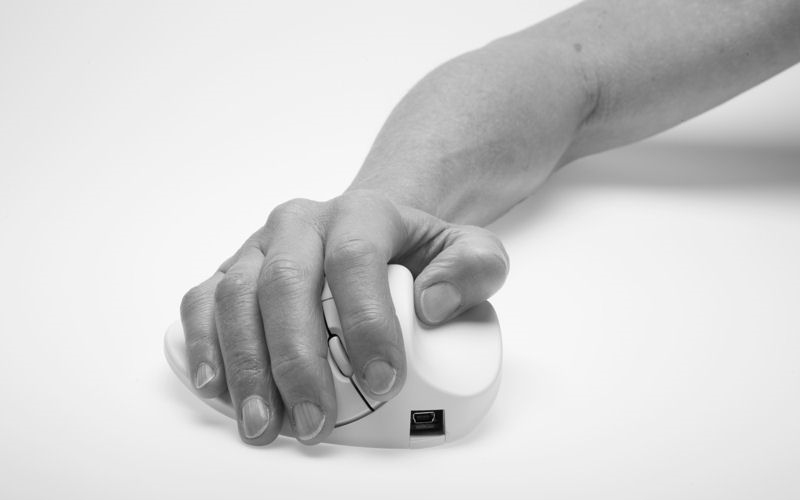 Eliminates Static Grip Force - The anatomically derived design with full base surround cradles the hand completely, preventing the user from gripping or pinching the mouse. The shape and sculpting of the Handshoe Mouse effectively harness the force of gravity on the hands alone to give the user full mouse control without requiring any static grip force. 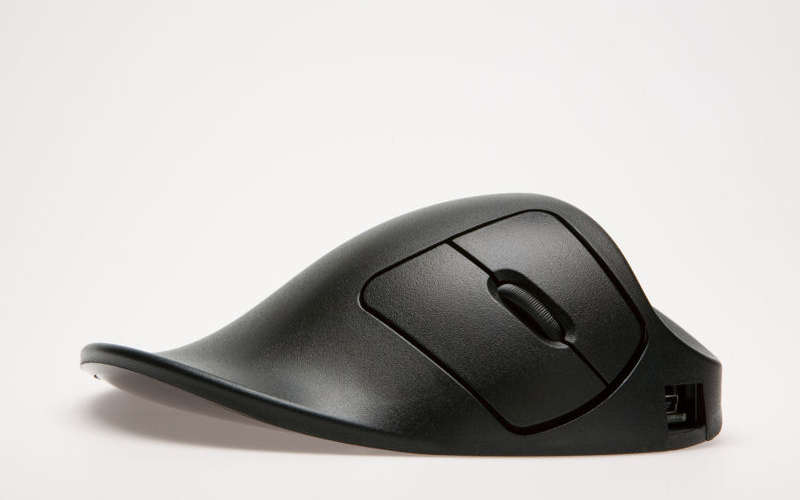 Reduces Pronation - The Handshoe Mouse creates a sloped position of the hand which reduces pronation by 20° (the hand when on the mouse is sloped with the thumb higher than the fifth finger). This reduction in pronation reduces tension in the tissues and tendons of the forearm because the forearm is no longer being required to maintain the hand in an unnatural "palm down" position. 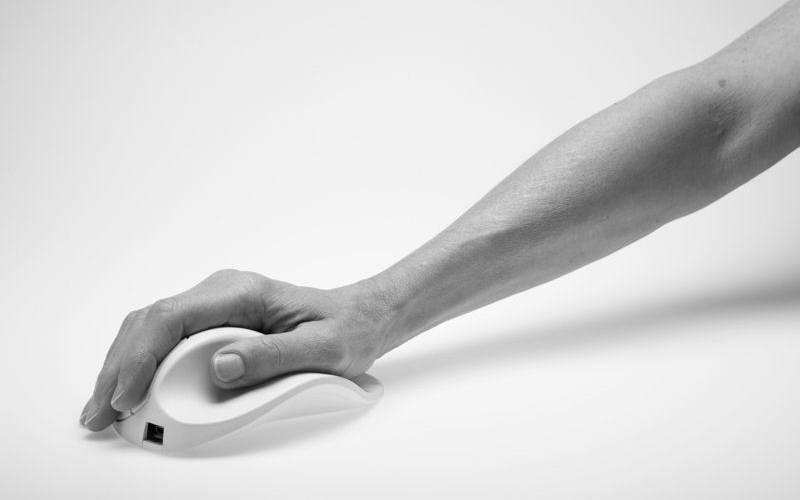 Reduces Wrist Extension - Another risk factor that the Handshoe Mouse addresses is wrist extension, which can be made worse with mice that have too high a profile at the rear without gradual inclined support for the wrist. 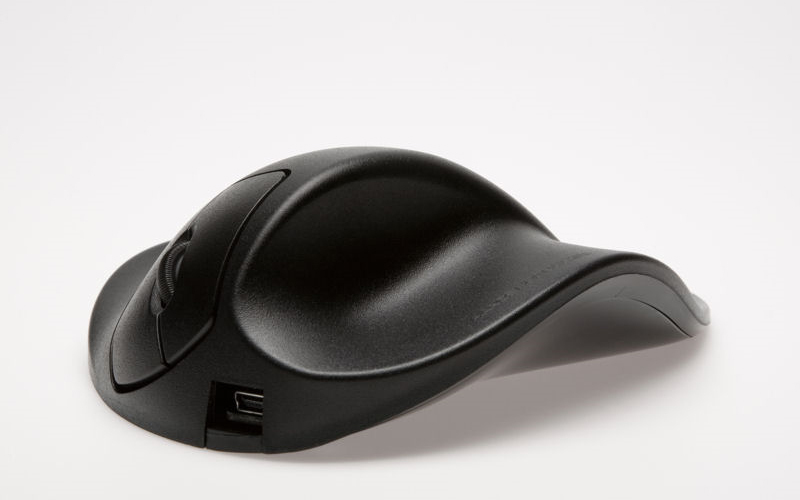 The gently tapered back of the Handshoe Mouse, however, provides such support through the elongated "ramp" that allows the hand and arm to gradually incline from the desk to the front buttons, preventing the wrist from excessive extension. This ramp also prevents users from planting the base of their palm and and trying to maneuver the mouse employing just their their wrist and fingers— another behaviour known to greatly increase the risk of developing serious Repetitive Strain Injuries (RSI). Learn More About Wrist Extension. Reduces Potential for "Anticipation of the Click" and Eliminates Finger Extension - The organic waterfall shape of the buttons means that the fingers are in a relaxed, curled "position of function" when resting on the Handshoe Mouse. 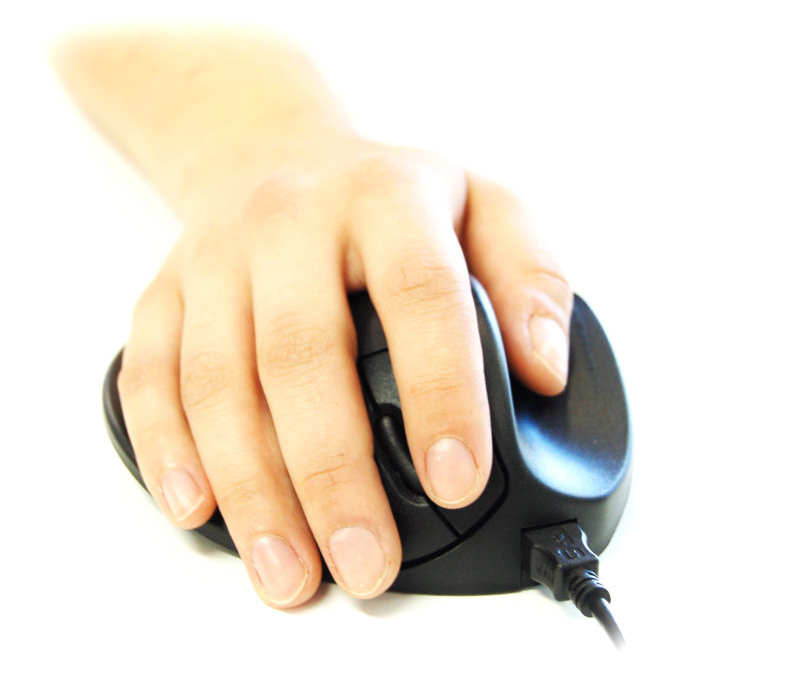 No hovering of the hand (which can lead to development of Trigger Finger), or stretching of the fingers or thumbs is ever required when using on this mouse. Reduces Hand and Arm Fatigue - The body shape, dimensions, and angle of the Handshoe Mouse are all carefully calculated to position the forearm and hand in a position which requires the least static tension in the muscles and tendons. The formed orthopaedic support eliminates any need to maintain tension to hold the hand and fingers in place. They are now able to remain at rest until there is a need for movement. For the fingers this movement becomes very minimal as they are already in position on the buttons and require nominal effort to slightly curl and relax (a natural action) to perform a click action. The forearm is also relaxed as cursor movement is spread throughout the fore and upper arm zones. Load Spreading - Users can gain the optimum benefit from the Handshoe Mouse when the work surface or chair arm are correctly positioned to provide support for the forearm. Utilizing this support ensures that the wrist is positioned in as neutral a position as possible, reducing the risk of potentially damaging Wrist Extension. It also ensures the user can avoid placing the weight of the forearm on the base of the palm, and facilitates load balancing of movement between the wrist, arm and elbow. By transferring much of the force required for mousing to the stronger muscles of the arm instead of the weaker muscles of the wrist or hand, the overall workload can be distributed in the manner most appropriate for the user. Sculpted Body Shape: The design elements that make the Handshoe Mouse ergonomic are combined in such a way as to provide maximum ergonomic benefits while maintaining an attractive and stylish look. Many users have commented that it almost looks organic, and bears some similarities in appearance to a Manta Ray. Multiple Sizes (4 Right-Handed and 3 Left-Handed): Just as one size of glove won't fit all hands, nor can a mouse. Because the Handshoe Mouse is designed to fit the hand just as a glove would, it must be able to accommodate different hand sizes and come in both left and right handed versions. As a consequence there are seven distinct models available. 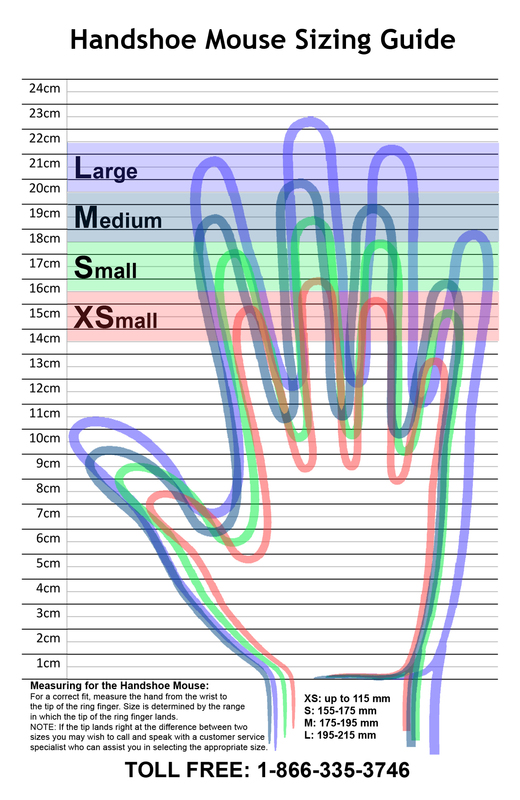 To determine which size is appropriate for the hand, see the Handshoe Mouse sizing chart. 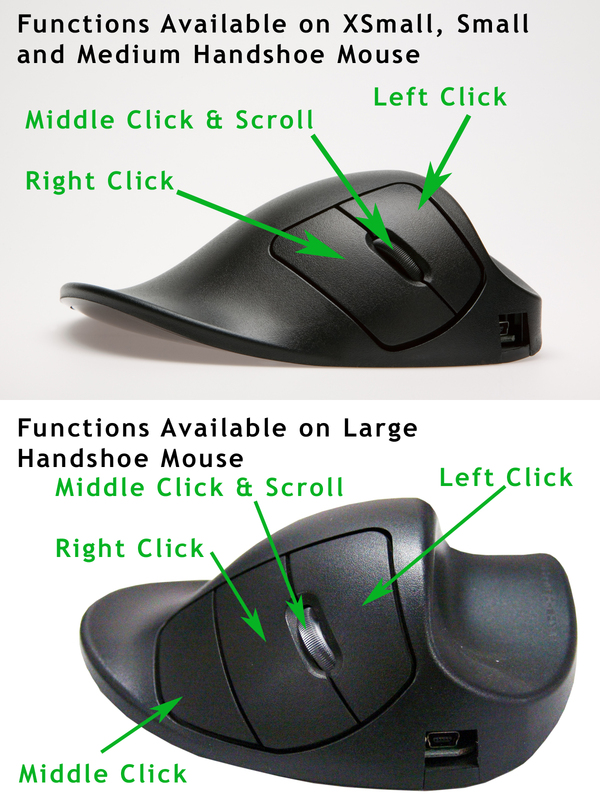 Two Buttons for Extra-Small, Small and Medium Sizes: The Extra-Small, Small and Medium sizes of the Handshoe Mouse have two tactile switches corresponding to left and right mouse clicks. Between these is a clickable scroll wheel (slightly smaller than a standard scroll wheel). Variable Weight: The weight of the Handshoe Mouse can be reduced slightly if desired by removing metal weights housed in a special outer compartment on the bottom of the mouse. The weights located in the outer chamber in the underside are specifically there to allow the user to reduce the weight of the mouse. Research by Hippus NV determined the ideal weights for the various sizes. However, if some users prefer a slightly lighter mouse, adjustment is easily accomplished. Wired and Wireless Models: In order to accommodate the widest possible range of working environments, there are both wired and rechargeable wireless versions of the Handshoe Mouse. Note that the Extra Small for the Right hand is only available in a Wired model. 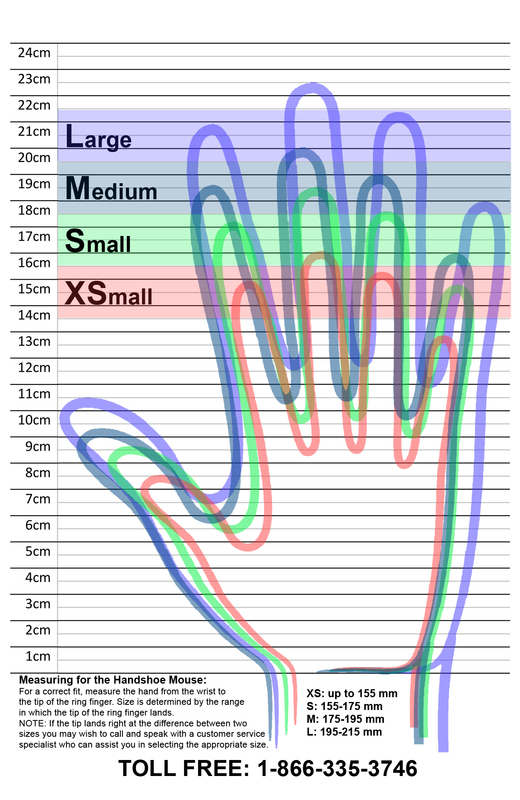 Hand sizes: To determine which size is appropriate for your hand, see the Handshoe Mouse sizing chart. There are no drivers available for any OS. Note: After extensive testing it would appear that the Handshoe Mouse WILL NOT work with a generic USB to PS2 adapter. Use Arm Supports - It is recommended that the forearm be supported either by the desk or the arm rest of a chair. Where neither of these are available there may be the possibility of adding a specialized armrest which will provide the support necessary to receive the greatest level of benefit from your Handshoe Mouse. Move the Mouse with Your Arm - Rather than trying to move the mouse with the fingers and wrist (the WRONG way), take the time to learn to move the mouse with your arm. 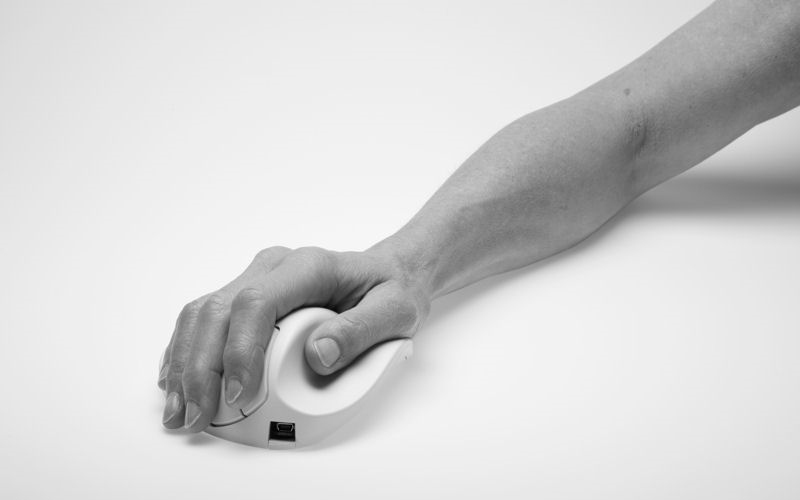 Not only does this reduce many of the risks associated with mouse usage but it also encourages beneficial bloodflow through the arm and hand. 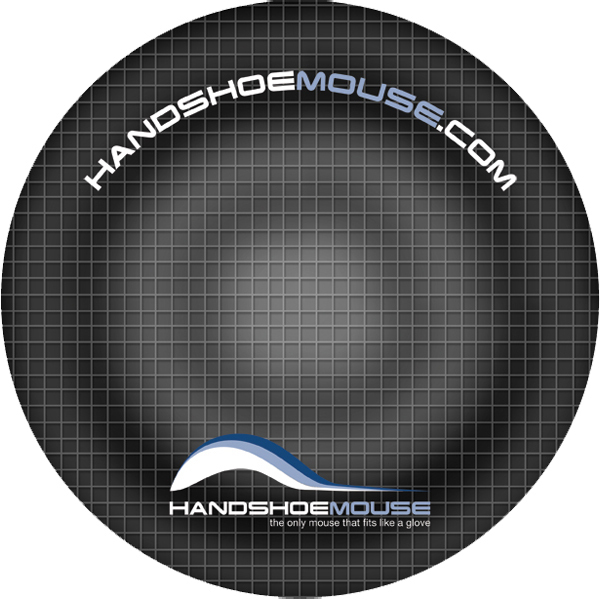 Use a "Low Friction" Mousing Surface - The Handshoe Mouse will work on virtually any surface but for optimum benefit it is recommended to employ a "low friction" mousing surface. 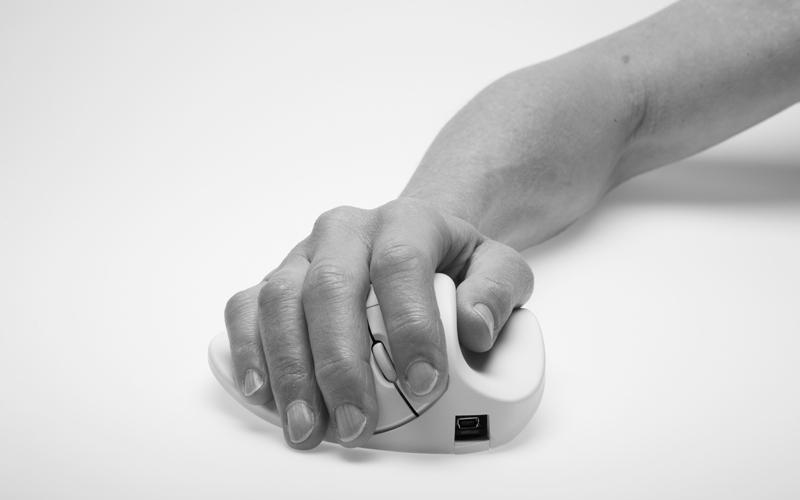 The design of the Handshoe Mouse transfers a greater amount of weight onto the mouse than with standard mice that people control with just their fingers. As a result, there can be a greater degree of resistance to initial movement. This can result in a "jumpy" movement when either starting to move the mouse or when slowing to accurately target a specific point. These potential issues can easily be addressed by employing a surface which is designed to address resistance. 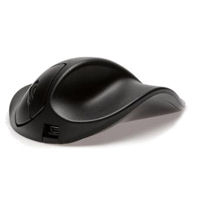 WowPads are a cost-effective way of providing this benefit to your Handshoe Mouse.